DAVID HAMME TTN Senior guard LaKeisha Eaddy blows by Rutgers senior guard Brittany Ray in Wednesday’s 62-51 Temple victory. Eaddy scored 16 points and held Ray to 15 points. In recent years, a game against Rutgers meant one thing for senior guard LaKeisha Eaddy and the women’s basketball team – a loss. 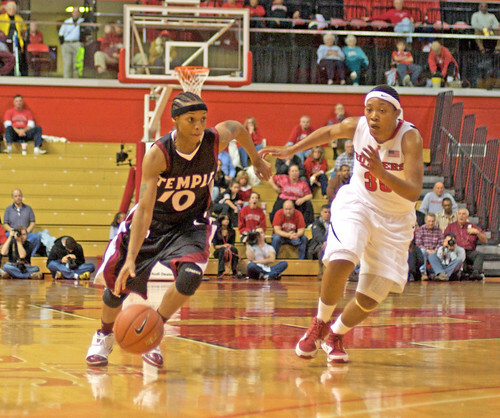 The Owls snapped the streak Wednesday when they defeated the Scarlet Knights, 62-51. The win marked the first time Temple has defeated Rutgers since the 2005-2006 season. After losing every other matchup with the Scarlet Knights, Eaddy said the win gave seniors a high note to go out on. The Owls, led by Eaddy’s 16 points, never trailed. Despite the double-digit margin of victory, Rutgers kept it close for a large portion of the game. After trailing, 38-31, at halftime, the Scarlet Knights fought back to close the score to 46-43 with just more than 9 minutes to play. A pair of jumpers by sophomore forward Kristen McCarthy and sophomore guard BJ Williams helped the Owls regain their composure and pushed the lead back to seven points. A jumper by Rutgers’ senior guard Brittany Ray cut the lead to five points, but the Scarlet Knights never got closer than that. Ray finished the game with 15 points but scored only four points in the second half. Limiting Ray, Rutger’s leading scorer at 15.1 points per game, was a focal point of the Owls’ plan, Temple coach Tonya Cardoza said. Cardoza shifted her starting lineup Wednesday, with senior forward Jasmine Stone replacing freshman Natasha Thames. While Stone’s statistics – no points, four rebounds and four fouls – were not the prettiest, her presence in the lineup brought some physicality to the game. It also allowed for Thames to get more comfortable, Cardoza said. “After the first couple of games, it looks like [Thames has] been a little indecisive and unsure, and I thought that bringing her off the bench might take a little bit of pressure off of her,” Cardoza said. “It actually worked out tonight because she produced more so than she has in the past couple of games. After going 5-for-19 in her last two games, Eaddy showed signs of life Wednesday, going 6-for-9 from the field, including 2-of-3 from beyond the arc. Temple played superb defense in the game and held Rutgers to 35.6 percent shooting from the field. The Scarlet Knights also had 21 turnovers in the game, something legendary Rutgers coach C. Vivian Stringer definitely noticed. One thing Rutgers did well on offense was shoot free throws. On the night, the Scarlet Knights shot 14-of-17 from the charity stripe. Sophomore forward Kristen McCarthy, who finished the game with 12 points, visited Rutgers while she was being recruited but did not receive a scholarship offer. From the sound of it, Stringer seemed to regret the decision. Stringer was also quick to sing the praises of Cardoza and her staff. Temple travels to Virginia to play the Hampton Pirates tonight at 7 p.m. The Pirates are currently in the midst of a four-game losing streak, including a loss to Atlantic Ten Conference opponent Richmond. The Owls return home Dec. 10 to play Ohio. Tipoff is set for 7 p.m. at McGonigle Hall.